Jamaican Bammy is one of our traditional food preparations that is still highly adored by all. 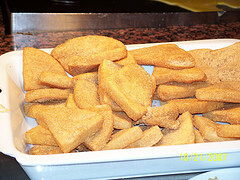 Correction, OK, perhaps not all, but I am yet to find another Jamaican who does not savor this old-time favourite. Bammy is made from cassava, a perennial woody shrub, grown as an annual crop. The first known inhabitants of Jamaica, the Arawaks used cassava as a staple part of their diet. Part of the preparation is the shredding the cassava roots and squeezing out the juice - which has much of the toxic compounds. The Bammy itself is a cake between 4/12 to 5 inches in diameter that is made from the stock. I understand it is called Manioc in the Latin American countries. Bammy is seasonal, simply because of the nature of the cassava plant, but I assure you, you can get Bammy anytime in Jamaica. If you are every told of short supplies, ignore that, check out 'Border' in St. Elizabeth, they seem to have it abundant there. Traditionally, Bammy is served with peppery Fried Fish. But much of that has been changing, many still have Bammy with fried fish, but more people have been using it in other dishes and even just for a snack, for example, with cheese. 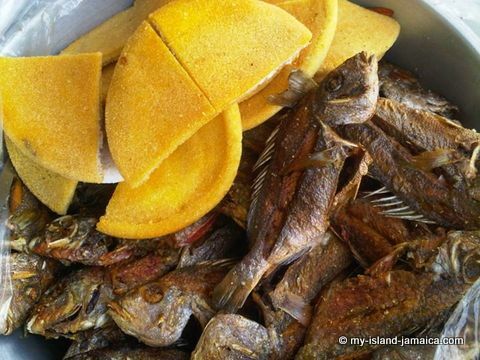 Forgive me, but I enjoy it most the way came to know it - Fried Fish and Bammy! Wring out as much of the toxic juice as you can and discard the juice. Divide the mixture up in to one-cup sized portions. Flatten each portion in to a thick disc shape. Add to a greased frying pan. Fry each side of the Bammies over a medium heat for 8-10 minutes on each side. Take out of the frying pan and soak in coconut milk for 5 minutes. Place the Bammies back in the pan and fry until they are a light brown colour. More free Jamaican Recipes here. Do you have a favourite Jamaican recipe? Why not share it with my other worthy visitors! They'll truly appreciate it. When you are through, click here to see contribution from others like yourself.